Matt DiBenedetto in the Monster Energy NASCAR Cup Series race at Las Vegas Motor Speedway. NASCAR driver Matt DiBenedetto, the guy whose last name usually gets replaced with “DiBurrito” online and whose reaction to finishing sixth at Bristol in 2016 got us all teary, tweeted video Tuesday saying he was unsponsored for the race this weekend. Eight minutes later, his competitors started pitching in money. 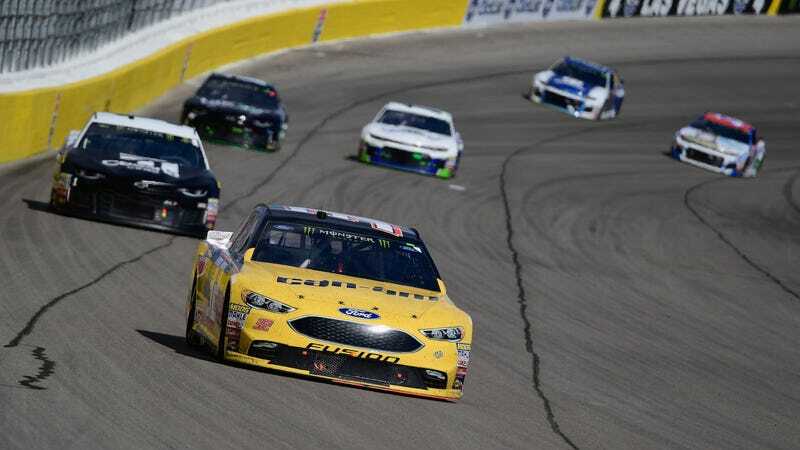 DiBenedetto is on the entry list for the Monster Energy NASCAR Cup Series race at Phoenix International Raceway on Sunday, planning to race a Ford for Go Fas Racing. The car was a solid white other than a few stickers on Tuesday, but the team said on Twitter that it probably won’t look like that for long. Fellow Cup Series driver Denny Hamlin responded to DiBenedetto just a few minutes after his video to say he’d drop in $5,000 toward helping the team out, and Kevin Harvick, who’s won the last two Cup Series races, offered the same amount soon afterward. Darrell Waltrip, who used to race but now just yells “boogity, boogity, boogity” at the start of them, signed on for $5,000 as well. Seeing as a top NASCAR race can cost hundreds of thousands of dollars, $15,000 isn’t huge overall. But DiBenedetto also offered pit passes to people who found businesses that agreed to come on board the car, and from the responses on Twitter, it sounds like several handfuls of those attempts were successful. Good for DiBenedetto, honestly. While a top-level race car isn’t the most heartwarming cause to get behind, it’s nice to know not everybody is thinking about themselves out on the race track. Alright, maybe “at the race track” is a better way to phrase that. Once they’re out there, it’s pretty much everyone for themselves.